Summer may seem far behind us however there are some destinations that can boast about their Summer-like climate well into Autumn. Greece is one of them, enjoying fantastic weather until October almost certainly, with temperatures easily reaching 25 degrees celsius during the sunny days. The Autumn nights are as pleasant as the Autumn days, and you can comfortably sit outdoors in the evenings, only needing a light jacket thrown across your shoulders. So since the weather absolutely permits, Autumn is a wonderful season to extend that Summer vibe, and experience the essence of a island holiday, by-passing the intense Summer hype. Corfu is an island in the Ionian sea that has it all; an elegant town of immense history, brimming with impressive landmarks that include fortresses, palaces and mansions; spectacular, awarded, beaches that are graced by azure waters, and verdant cliffs that topple down to meet the sea; delicious, local gastronomy that is found nowhere else in Greece and an overall charm that is hard to resist. October’s weather can still make a beach holiday enjoyable, especially on a blue flag beach resort such as Mayor Pelekas Monastery on Kontogialos beach. Situated not far from the picturesque village of Pelekas on Corfu’s western side, guests can explore the rural part of Corfu at their leisure in between being pampered by 4 star services of the resort. Folegandros is almost a hidden gem, overshadowed by the more popular and flamboyant islands of Santorini and Mykonos. However, the natural beauty of this island is disarming with its steep cliffs and barren landscapes that plunge into the blue waters of the Aegean. Island life in Folegandros is demure and frugal, as it has been for decades. On this island, it would appear that time has stood still while, having escaped the radar of mass tourism, it remains largely unaffected. Visitors of Folegandros can expect to be greeted warmly by the locals, often riding their donkeys which is their usual way of getting about. Arriving at the main port, Karavostasis, you will pleasantly be surprised at the cleanliness and transparency of the water. Further inland is where you can enjoy a 5 star hospitality in the Anemi Design hotel in Folegandros that absolutely respects the island’s character. Choose an Autumn cruise if you want to fully capitalize on the fantastic post-summer weather. The sea is evidently smoother than in August, and those who are sailing enthusiasts will confirm it. August is renowned for the ‘meltemi’ winds that can go up to 8 beau-fort; at these wind speeds it is a challenge to be on land, let alone being at sea. Therefore, an Autumn cruise is the best way to discover a handful of islands, while extending the summer feeling of a yachting holiday. Variety Cruises offers a variety of boutique cruises around Greece among some other fantastic places, and are categorized somewhere in between sailing and conventional cruising. This gives passengers the best of both worlds; more comfortable facilities a yacht, but the advantages of a smaller size vessel than a massive cruise ship. I used to be the quintessential lover of Greece in the summer. As I have gotten older I realize that autumn is my favorite time of the year. The crowds are gone and the air is crisp in the way that reminds me of when I was a little girl and would travel to islands and feel alone, in a good way. There is a lot to be said for experiencing a destination on your own terms. What is your favorite time of the year to experience Greece? Greece is undeniably a summer classic. With so many incredible places to discover ranging from major cities, bucolic mainland towns and villages to cosmopolitan or off the grid islands, choosing your next Greek summer destination poses one of the most enjoyable dilemmas yet. Combining ancient heritage, impressive landmarks and scenic landscapes, we have singled out 2 plus 1 iconic Greek destinations for summer that consist of all the elements that Greece is able of offering to even the most demanding of travellers. When thinking of Athens, the Acropolis is the first thing that comes to mind. Although Athens is a city that can be explored across all seasons of the year, spending a few days discovering it during summer proves to be very rewarding. The wonderful weather and clear blue skies during the summertime, reveal Athens at its most glorious. The old city of Athens was essentially built around this ancient marvel, and as the eras succeeded one another, adding their own architectural and cultural charm to every neighbourhood that surrounds the Acropolis, creating an enchanting amalgam of experiences for visitors to indulge in. Contrary to other major capital cities, central Athens can easily be discovered by taking a relaxed saunter around the perimeter of the Acropolis rock. The areas of Koukaki, Thiseio, Monastiraki, Anafiotika, Plaka and Psirri make up the conflicting yet charming tapestry of the city. All of these neighbourhoods have their own distinct flair, brimming with quaint cafes, bars, markets, restaurants and loads of interesting tourist and non tourist shops that are buzzing, both day and night. For fully immersing into the intoxicating aura that the iconic monument emits, you can choose to stay at the Design AthensWas Hotel in Athens that offers Acropolis view Suites. It is the sister hotel of Anemi Hotel in Folegandros. Athens also has a coastal side to it, and the Athenian Riviera counts more than 40 km in length. It is not comparable to island coasts, as you would imagine, but a drive along it will fill your mind with some wonderful visuals, especially if you wish to venture out to Sounion, where the imposing Temple of Poseidon stands proudly atop of a hill. - Taste the local street food delights, such as the koulouri, a bread ring sprinkled with sesame seeds, sold by many vendors, and the famous Greek souvlaki from Monastiraki Square. - Visit the Acropolis museum, where there are many ancient artefacts and items that will inspire you and amplify your reverence for the accomplishments of a civilisation that flourished many centuries ago. - Walk through Anafiotika by night, one of Athens’s oldest residential areas, where the houses and cobblestone paths leading down from the rock exude a wonderful island feel. The seafront, capital town of Greece’s largest island, Crete, offers a wonderful base from which onward exploration is an easy task. Especially if you have not visited Crete before, Heraklion should be your first stop. Consider staying at the elegant Galaxy Hotel Iraklio which is located just on the outskirts of the old city, offering 5 star facilities and amenities, and a wonderful pool in its courtyard for a quick dip to beat the summer’s heat. Your well being and a good night's rest is guaranteed at the pure wellness luxury rooms of Galaxy Hotel. 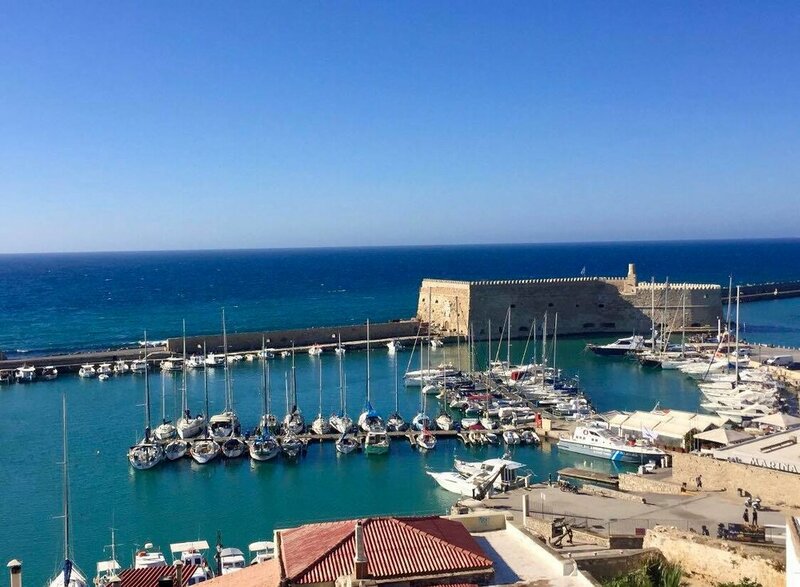 Now, Heraklion’s harbour is quite iconic, with the Koules fortress, surrounded by Venetian built, fortified walls that act like a raised platform for a perimeter promenade, revealing the gates of the old city. The central square of the city, Lion’s square, is where all intercity roads meet. There is a marble fountain at its centre, the Morosini Lion fountain, and opposite it you will find the elegant Basilica St. Mark Municipal Gallery, while in close proximity, lies the magnificent Venetian Loggia. 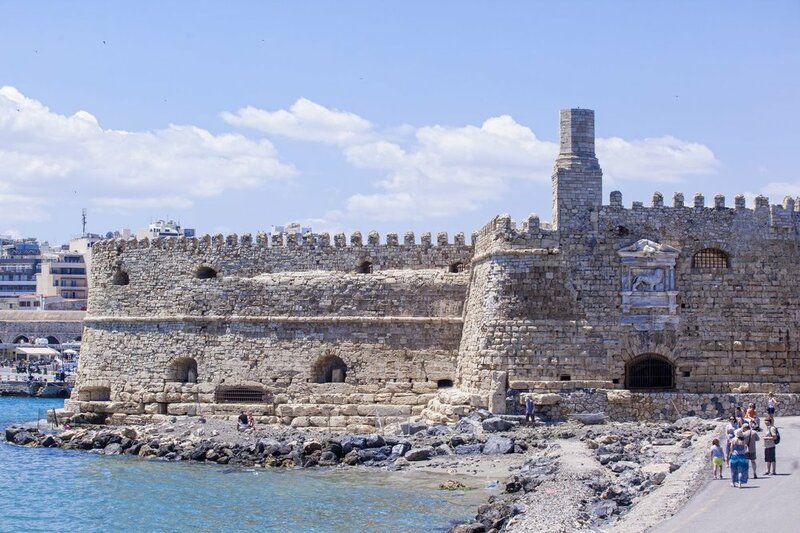 With numerous museums and some truly stunning churches nearby, Heraklion has a diverse charm that spans centuries of history. Last but definitely not least, the greatest treasure of Heraklion which is its most emblematic landmark, is the Minoan Knossos Palace. Located just under 5 km from Heraklion centre, this ancient site is one of the few that still manage to preserve its original colours. It is a common misconception that the ancient Greek temples were bare and monochromatic. Knossos Palace still retains its red and blue wall paintings as well as some astonishing frescoes. Furthermore, there are some pretty amazing beaches within a 10 km radius from Heraklion. Amoudara beach is 5 km east, while Tombrouk and Amnissos beaches lie 9 km west, while Kokkino Hani beach is a popular spot for SUP (stand up paddle) and surfing. - Walk on the fortified walls around the old part of the city and take in the amazing scenic sea vistas. In fact, this is one of the top things to do in Heraklion. - Visit Nikos Kazantzakis’ tomb, located just outside the city’s walls, which is quite a poignant site, given the writer’s great contribution to modern Greek literature. - Did you know you can also golf in Crete? Hersonissos boasts a state-of-the-art, exceptional 18-hole golf course that boasts some staggering landscape views. No article on the subject of iconic Greek destinations could leave Santorini island out. The most emblematic of the Cyclades islands, if not of all the Greek islands, Santorini is most known for its romantic association, its gorgeous sunset over sea and its volcanic landscapes. A crescent shape, stark white, clifftop settlements that cascade down the Caldera cliff, blue dome churches and colourful beaches of black, red and white complete the tapestry that makes Santorini so unique. Contrary to popular opinion, or the stereotypical view that Santorini is often seen by, this iconic island is actually able of offering a wider range of experiences beyond the classic romantic couple retreat destination. Yes it is glamorous, filled with luxurious boutique hotels; yes it is cosmopolitan, with a vibrant nightlife and many top tier restaurants and bars; yes it is full of dramatic landscapes that will take your breath away. However, you may be surprised to know that Santorini is home to a significant archaeological site, that of Akrotiri. For being able to fully explore the area, you may consider staying at some secluded, luxury suites in Akrotiri. You may also be surprised to know that its underwater terrain is especially beautiful, due to the atypical geomorphology. You may want to know about the other, lesser known settlements apart from Oia village and Fira, such as Pyrgos that even has a medieval castle to show for. So when considering Santorini as your summer destination, also bear in mind that it harbours an unseen side that can be ever so rewarding. - Visit the Akrotiri Lighthouse; it is located on the southern cape of the island’s crescent shape, and it is less crowded to watch the sunset by. - Don’t take the donkey ride. Donkeys have been a part of Santorini’s biodiversity and were once the only means of transport around the island. Now, they are a tourist attraction and often have to work many hours in dire conditions. - Take a glass bottom boat tour to the volcano, so you can get a glimpse of the underwater world. Or choose to visit Santorini as part of a Greek island cruise, which means you can discover more destinations than one. You can comfortably visit any of these destinations until mid October but for optimum beach time summer should be your choice. "The light of Greece opened my eyes,penetrated my pores,expanded my whole being." For those who remain firm supporters of luxury holidays but would like a chance to experience some new, off the beaten track Greek destinations for a change, then this post is for you. Trade the cliché Santorini and Mykonos for Corfu, Paros and Monemvasia and you will discover that some less popular locations actually have a lot more to offer, without being envious of their more popular counterparts one bit. Corfu island is rich in dramatic cliff landscapes, in diverse history that has evidently left its mark on its architecture; Paros is one of the more demure Cycladic islands that is perfectly suited to a more congenial island holiday; Monemvasia is a semi-mainland destination that boasts scenery taken right out of a fairy tale. Corfu island is not so off the beaten track perhaps, but those who have visited it often return again to experience a different side each time. Suited to a variety of different holiday experiences, from romantic couple getaways to family vacations, it is a place that comes highly recommended. The old town of Corfu is the most enchanting of its locations, brimming with vibes of a historic city that has seen a lot of turmoil in its days. The ‘kantounia’, or else the weave of cobblestone alleyways will lead to you mansions, palaces and fortresses. Couples seeking a luxury holiday there can choose the beautiful Mayor Mon Repos Palace Art Hotel in Corfu town, and experience an almost regal stay. Its design has been inspired after the famous Corfiot landmark, Mon Repos Palace, and there are art pieces decorating its grand halls throughout. Sea views are also part of the deal, especially if you choose the penthouse Presidential suite, which is the grandest of all the classy, elegant suites this hotel has to offer. The furnished terrace with impeccable views onto Garitsa Bay and the old Fortress will simply take your breath away. If a city break is not what you are looking for, then the luxurious Mayor La Grotta Verde Grand Resort, that is nestled in the embrace of a verdant cliff and the emerald beach of Agios Gordios, will definitely deliver. The little things are what make a holiday memorable. 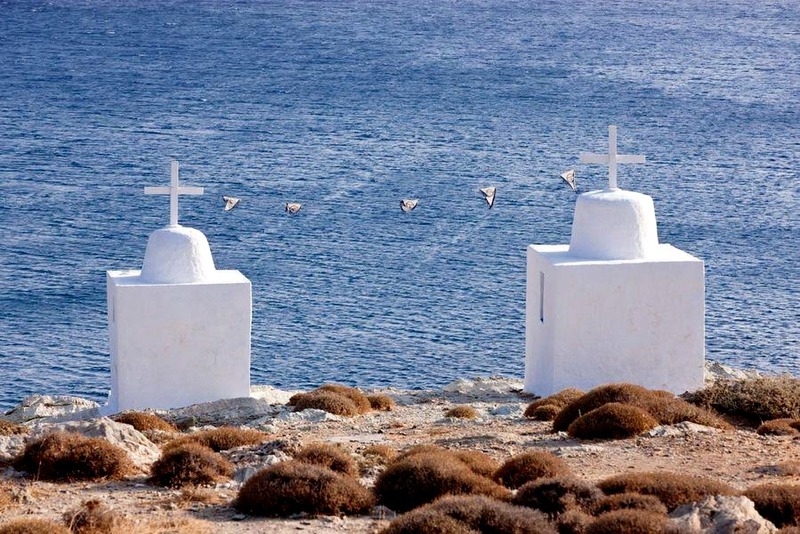 Paros island offers its visitors the best of both worlds. A traditional Cycladic island destination that has a lively nightlife, wonderful beaches, locations for water sports and more secluded spots, able of harboring more intimate moments in the lap of luxury. 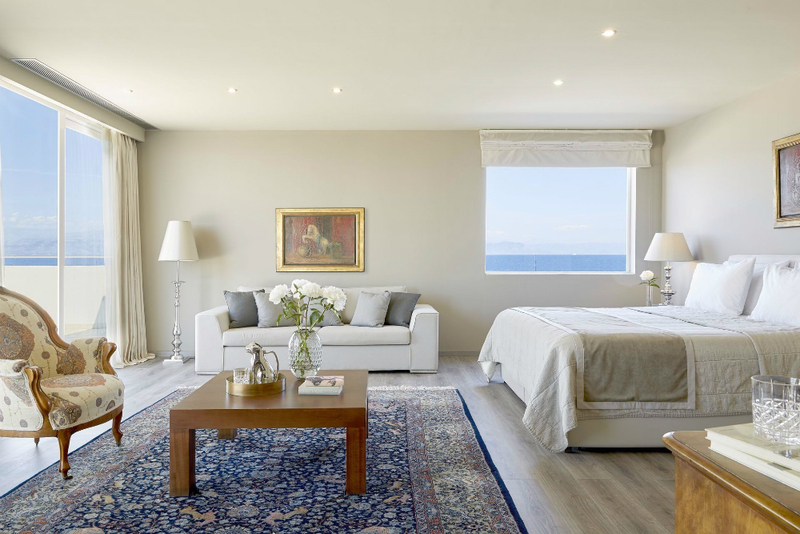 One beautiful hotel, offering luxury suites and villas in Paros promising an incredible holiday experience, is situated by the sea and overlooking Parasporos beach. This is the perfect location for a hideout holiday, away from the island’s hustle and bustle in Naoussa town, but still close enough for the occasional night out, island style! 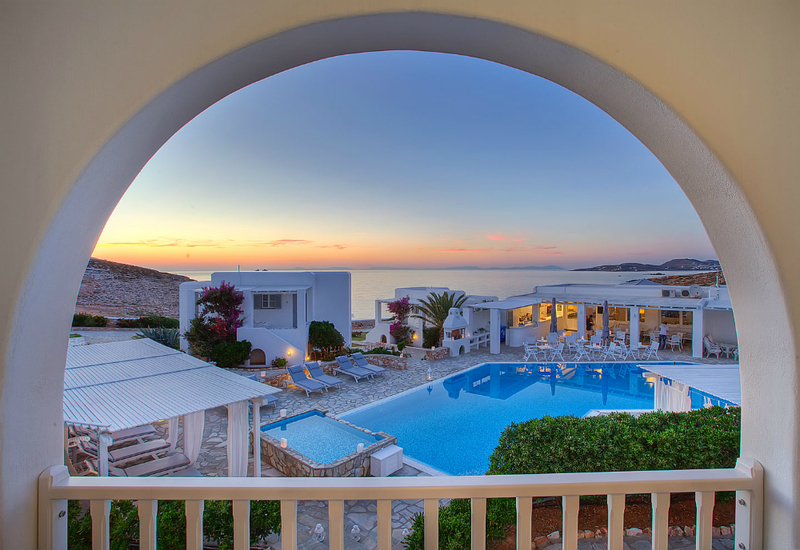 Minois Village Hotel Suites & Spa welcomes its guests to experience the most romantic side of Paros, all the while sampling the delectable local gastronomy and surrendering to the pampering treatments of its Thalassa Spa. Sunset views are best enjoyed at the hotel’s Deck Lounge Bar, where the colours of the retreating sun paint a masterpiece in the sky. Yes, Santorini’s sunset is astonishing, but the hordes that gather to watch it actually demote the entire experience. Plus, there are only so many times you can visit Santorini, and so Paros is a fantastic alternative to broadening your holiday horizons in the Cyclades. Views like this are what dreams are made of! Onto the semi-mainland, fairy tale destination that is Monemvasia. Located in the Laconia prefecture of the Peloponnese, Monemvasia is absolutely charming for many reasons. The area is primarily a mainland destination, although one of its most iconic settlements is perched on an verdant rock island that can be reached by a causeway. A place that has undergone countless conquests for centuries, it was originally under the auspices of the ancient Greek civilization, the Spartans during the Bronze Age and later the Minoans, then the Romans took over, followed by the Byzantines, the Venetians and the Ottomans. This has resulted in an area that is full of fortifications that exudes a Medieval fairy tale feel. Monemvasia’s luxury historic mansion hotel of Kinsterna is one of the most extraordinary hotels to stay while vacationing in the region. With a luxurious array of suites, villas and residences that fuse traditional design of exceptional finesse with contemporary comforts, its 5 star facilities and superior services immerse guests into the enigmatic allure of Monemvasia ever so effortlessly. It is a environmentally friendly, 17th century heritage monument with river swimming pools that run throughout the property while its is surrounded by gardens and vineyards. Kinsterna offers its guests a plethora of sensational experiences too, including activities in nature while Monemvasia’s stunning beaches are also relatively close by. Twitter: Do we really need 280 characters? I've been an outspoken critic of Twitter changing the 140 character limit. Why? I've always thought that whatever needed to be said could be said well in 2.5 sentences. It turns out today... I needed more than that. Here is my rant on Steemit. Why this island? Why now? Questions I always get from the people who know me best. It's simple really. Syros is the island my mother was from and as a child I would come and roam freely up and down the massive staircases (massive to a child) and get lost in the maze like passageways of Ermoupolis. I've always been fascinated by the exquisite mansions of Vaporia and the way the water would wildly splash up against the buildings. The island always felt elegant. A place where I would feel like I was in another reality. I guess in many ways I was. Vastly different from the privileged life I had lived up until that point. As a child I had a love/hate relationship with the island. On the one hand it was an escape but the small town feel felt stifling and as much as I looked forward to returning, I would quickly feel like I had to go. As I got older the inevitable return in the summer became less of a priority until it became a distant memory. My job in the Travel Industry took me across the world and showed me places I had only read about in books. My wanderlust always the focus, with my adventures each becoming more important than that little island I had long forgotten. Fast forward to many years later. The adventures are still there but less of a priority as I've settled down into adulthood. I lost my mother way before anyone should ever lose a parent so I lost all desire to connect with anything that in any way reminded me of my loss but in the back of my mind I knew I would one day return. I struggled as most writers do (for quite a few years.) but a couple of years ago I finally felt ready to once again visit this little island that my mother loved so much. Time had passed and my focus strayed away from writing (the struggle was real) and leaned more towards Destination Marketing and Social Media. As I got more successful I kept thinking that the time was right and the time is right, now. A year ago it dawned on me that I needed to get a great group of content creators to come experience Syros, the capital of the Cycladic Islands. When I researched it a bit, there didn't seem to be the same emphasis on tourism as there was on other Greek Islands so on a business trip to Athens I decided to take a spontaneous trip to Syros. The island was exactly the same as what I remembered with a charm that captured my heart. I decided in five minutes that my initial idea of bringing content creators was a good one because my passion is personal and I finally understand how my mother felt when she would describe the island of her childhood because it's the island of my childhood too always in my heart. So here we are... September is around the corner and WE ARE COMING. #DiscoverSyros mission is to show the unspoiled charm of the exquisite island, Syros. Santorini: 3 Exclusive Stay's On This Magical Island! Deciding on Santorini as your holiday destination is bound to open up a world of incredible experiences, whatever your circumstances, preferences and vacation goals, provided you choose the right place to stay. There are numerous hotels perched on the infamous Caldera perimeter offering their guests what comes naturally to Santorini: the uninterrupted sea, volcano and sunset views. Yet when it comes to having a well rounded and totally satisfying experience experience to satiate all of your senses, the options become narrower. In light of this, here are three exclusive stay experiences you can have that will definitely reconfirm Santorini as one of the finest and most enchanting holiday destinations. Imerovigli is one of the most quiet spots on the island, and for this reason it is mostly in touch with nature. Away from the crowds that many would like to avoid, and built on a beautiful hillside location, Andronis Concept Wellness Resort invites you to experience the vast tranquility of the endless blue. Subtle balances and delicate touches between minimal and modern decor create a soothing ambiance throughout while the open sky is an awesome work of art from dusk til dawn. Couples can choose a two person suite and indulge in the infinity pool, sea and volcano views directly from their bed, while families up to four people are also welcome in the family friendly Fabulous Suite across three levels. Wellness is key here, and the Kallos Spa features many therapeutic relaxation programs including a hammam apart from yoga sessions, detox nutrition options and morning workouts, as well as a fitness centre. Dining at the in house Throubi restaurant will make your jaw drop with its impeccable outdoor setting and with its carefully devised gastronomic selections. Romance takes on many shapes and forms and it all depends on how you define your dream romance. It may be utter seclusion you are after, or somewhere where you can disappear for a while but still be central enough to experience any or every daytime activity, the vibrant nightlife, the cobblestone streets with the blooming bougainvilleas, when and how you want to! Renew your vows in Fira at Andronis Honeymoon hotel, spend your honeymoon or even plan your wedding in one of the top rated romantic venues in Santorini’s capital, and surrender to the luxurious and pampering amenities; atmosphere is key here, in surroundings that are lavished with Bohemian touches and minimalist design that amplifies the factor of serenity that prevails. Feel the sense of being at your most luxurious home in the Bliss Suite whilst experiencing exceptional levels of hospitality, leaving you with loving emotions from morning to night. Oia is the most sought after location in all of Santorini, visited by many people who want to get a glimpse of the the world famous, fiery sunset that makes the sky look like a true masterpiece. What if you could combine staying at this popular location with the privacy you need, surrounded by discreet luxury that pays tribute to the Cycladic tradition, plus one of the island’s best restaurants, the Lauda, within the outstanding Andronis Boutique Hotel? Greek Nouvelle cuisine, on an breath-taking spot carved into the cliff, while you retreat to an authentic cave interior suite with an infinity pool and an outdoor heated jacuzzi in the the privacy of your own terrace. The sunset, volcano and sea views are just a bonus to the feeling of absolute contentment created in this unsurpassed environment of holiday pleasure. So when you choose your next vacation hot spot you can confidently pick Santorini as a romantic, gorgeous, laid back place that will give you the relaxation you deserve. Boutique Way To Travel: The Key To Amazing Travel Experiences! As people travel for all sorts of reasons, travel has become quite the trend, and has given rise to a multitude of different career paths and professions each having developed a certain ‘knack’ for traveling, offering the world the promise of incredible travel experiences. Niches and categories of travel have surfaced, each trying to appeal to a different sentiment or clientele. And this is exactly where the various subdivisions of travel that have emerged, become necessary. One of the torch bearers of these subdivisions is in fact the ‘boutique’ way of travel. Boutique but not in its strict sense, rather we define ‘boutique’ as a an experience that is not consumed on a massive scale, something more select and more refined, appealing to personalized calling. And here we will be looking at three ways by which to achieve a boutique travel experiences. Boutique hotels have a entire list of requisites to fulfill before claiming the title, and they are singled out for their general propensity to sleek and stylish environments, their personalized services, and their small size. Greeks have a saying that is very fitting here: “quality perfume comes in small bottles” and the same can be applied to small size boutique hotels, in particular the sister hotels that are members of the Design Hotels, the dapper Athens Was hotel located in the heart of the ancient Athenian centre, and the carefree, Anemi hotel in Cyclades’ most underestimated island. Two stunning hotels, that create an alluringly fascinating ambiance for guests to linger in. Fully grasping the true identity of each destination, each hotel is dedicated to lavishing its guests with the personalized services amidst an environment of haute design, blending the boundaries between luxury and laissez faire hospitality...after all, it runs in our Greek genes! This boutique experience relies on the traveler knowing which destination they want. If you daydream about the ideal holiday, yet still lack the confidence or skills to organise it, then keep reading. Even if you haven’t the faintest or better still if you do actually have an idea although it may still be in embryonic or schematic stage, then a boutique travel company such as Theros is precisely the key to your next tailor-made amazing holiday experience. Most suited to leisure travel that will enhance your days with experiences perfectly matched to your preferences, budget, desires and dislikes. Theros, meaning summer in Greek, specialises in uncovering your next handpicked paradise in Greece! Discover the mysterious and enchanting Dodecanese islands that are infused with an air of the orient, or immerse yourself into the blue on white serenity of the Cyclades islands. Find your home away from home in the land of Zorba, in a traditional house or luxe villa making your mornings fragrant with the fresh scent of jasmine or the euphoric lavender. Are you a fan of yachting? Even better. Greece is a country best enjoyed by roaming its seas, its eonic pelagos, and by selecting an expert holiday tailor-maker such as Theros, you are already high in the rankings for experiencing the most subjectively amazing holiday yet! And finally coming onto the subject of combining the liberating experience of being at sea, with holidays that are brimming with new visuals at every knot, visuals of not just its natural beauty, but of all the important antiquity sites that Greece generously has dispersed around. Variety boutique cruises offers you the chance to experience 3 things at once. Choosing to holiday on a boutique cruiser means you combine the activity of sailing with the necessity of accommodation. The wonderful result of this is being greeted by a different, magnificent seafront each and every day of your stay!And there’s more: consider some (optional) cultural excursions on all the high profile archeological sites and truly immerse yourselves into the real Greece. Few people can say they've experienced the private home of a billionaire but If you have time, money and 28 friends that would like to tag along, Necker Island is a paradise you should experience, at least once in your life. Tucked away in the heart of the Caribbean, Necker Island is part of the British Virgin Islands and accessible only by boat. You must be staying at the island in order to go there, making it a private getaway that is very popular with celebrities and fellow billionaires. An All-Inclusive experience, having your own private island for a week includes all meals, drink and local excursions. The staff, while low-key are very accommodating and have planned evenings so if you think you are going to go and laze around for a week, think again. There are themed parties, day excursions to other local islands like (Kate Moss fave) Jost Van Dyke, Tortola and Virgin Gorda. A huge highlight, for me while I was on the island was the vast array of wildlife. Richard Branson is a lover of animals and making sure that endangered species are protected. There are Flamingos, Lemurs, Tortoises and more species of birds then I could ever imagine. Another highlight enjoyed by all was lounging around the pool and suddenly seeing a kayak, loaded with sushi & flowers. The most colorful display of food I've ever seen. The story of Mr Branson and how he discovered this paradise and decided to make it his home is inspiring and well worth a listen. So many beautiful, exotic places in the Caribbean, all with a personality that is unique to the environment. If you ever have an extra $57,000 a night (five night minimum) then I highly suggest you visit and enjoy this 'Once in a Lifetime' experience. 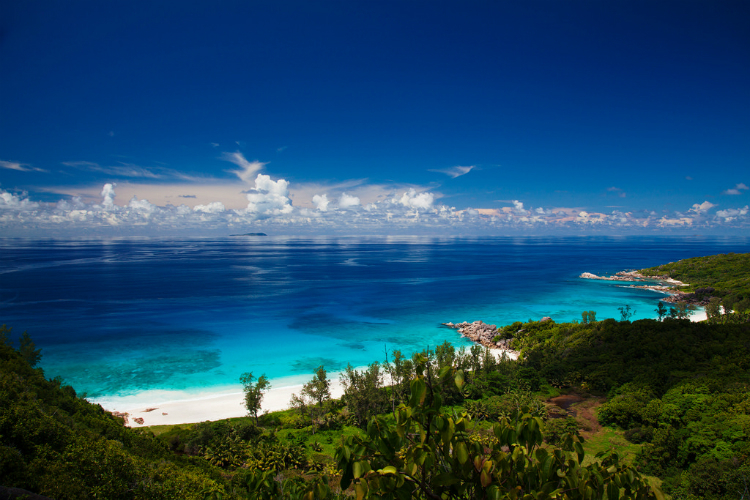 The story of this Caribbean Island is told my the man himself in this video. Enjoy! !